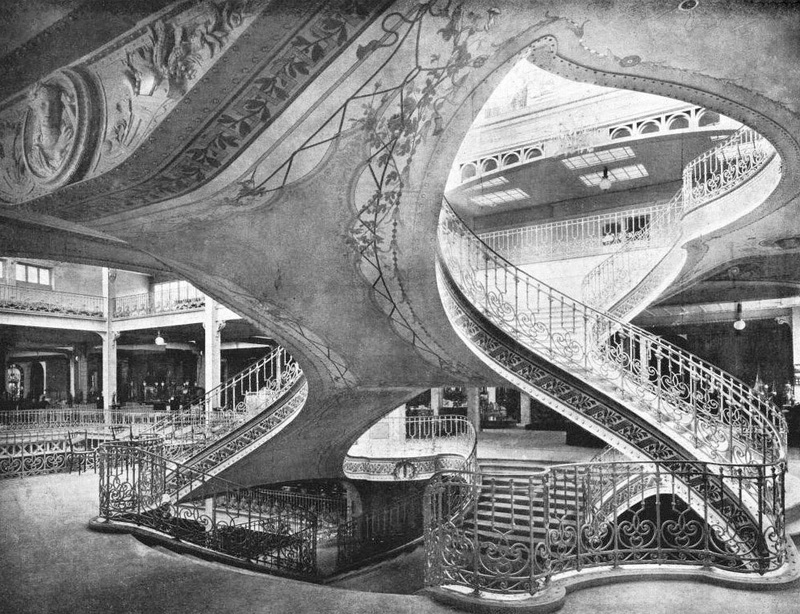 [Image: A staircase in the Grands Magasins Dufayel; view larger]. The second staircase I wanted to post today—here’s the first—is from the Grands Magasins Dufayel, a vast, 19th-century department store in Paris. View it larger. Aside from the obvious grandeur of the structure, what makes this spatially noteworthy is the fact that one floor is pinched together with the next, and that the self-supporting “pinch” that results then becomes formalized as a stairway, a hyperbolic object in space that allows passage from one level to the next. It’s as if a loop has been pulled or extracted from each level and then woven together—in effect, using a self-intersecting geometric pattern as the basis of a floorplan. In any case, what I like in both examples (this one and the previous staircase), is that you have two floors or levels, obviously, but then there is the emptiness that separates them, a gap buzzing with unrealized forms of connection, and that you can fill that gap with pinches, spirals, knots, and loops, and that the magic of a well-designed staircase is precisely in giving material form to the invisible math that hovers in the space between floors. Two gorgeous junctions, I particularly love the fluidity of this one. I can almost imagine it gracefully extending through a building for many levels. Turning the floor spaces into a sort of mobius strip. I'm sure you've seen this but in case not there's an exhibition of models and prototypes at the Cooper Hewitt since December that includes some wonderful experiments in staircases. Oh, wow, those are great — thanks, John!